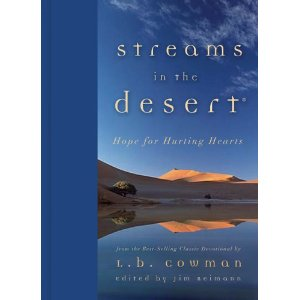 “Streams in the Desert”…probably the most read book in my home. It is a 366 day devotional book first printed in 1920 and written by L.B. Cowman. Mrs. L.B. Cowman was a missionary in China and Japan between 1901 and 1917. “Streams in the Desert” was inspired both by this time, and as she looked after her dying husband for six years. Why 366 days…maybe it’s one to grow on. 1990…I received my copy in the spring when I graduated from high school. I sent out invitations just like all high school students do, hoping to get a stockpile of $20 checks, I’m kind of ashamed to say. My Sunday school teacher, Mrs. Bridgesmith, had a lot more wisdom than me, thank goodness, and sent me a “Streams in the Desert” flip calendar. I guess she also knew I wouldn’t read a book, now that I think about it. I was young, naive, full of life, full of myself, and ready to run. “Streams in the Desert” became comfort to me like a warm bath on a cold night, that extra hour of sleep on Saturday morning, or that great big bag of chips! It always worked. Fast forward to 2001. I worked with this really neat couple in the television industry. Both of them just exuded fun. When we were with them we just laughed till our sides hurt. They had dated forever and were engaged to be married. As we all did back in those days, they traveled a whole lot. One weekend while they were out of town, he suddenly, at the age of 42, died of a heart attack. Her world stopped. I went to see my friend a few days later and I took her a copy of “Streams in the Desert”. It was the only thing I could think to do. And even though I knew how much the book meant to me, it still felt shallow. After all, that’s what everybody does when someone loses a loved one…they bombard her with daily devotionals and Christian books telling them that everything will be okay. It felt predictable, and insignificant to say the least. She took the book, just placed it in her lap and we talked and cried together. Fast forward to 2012…my friend had married a wonderful man. She has this amazing stepdaughter and a really cool little guy they both adopted a few years ago. Her life moved on in a magnificent way. I don’t get to see my friend these days because she and her family moved to Chattanooga, but just the other day, I opened up Facebook and there was this message…”Today I’m thankful that 11 years ago, my friend, Kelly, gave me a copy of “Streams in the Desert”. Wow. I wrote her back…”Don’t thank me, thank Mrs. Bridgesmith, for not sending me 20 bucks for graduation! -Check out Kelly’s blog at www.thesimplifiedfamily.com.